The staircase is an integral element of a modern two-story or three-story country house. It can be made of various materials, the most common of which are wood and concrete. In any high-rise buildings, an integral part is a ladder made of either wood or concrete. 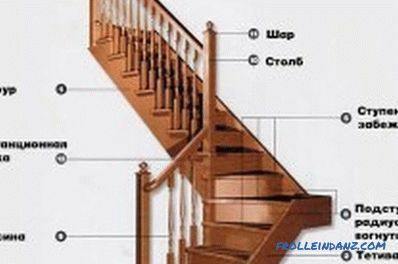 In order to efficiently carry out the assembly of the staircase with your own hands, it is necessary to carefully study all the nuances of the design of each structural element. Wooden structures can be screw or mid-flight. Screws are rarely used. The main reason is the low functionality of the structure. It will be extremely difficult to carry furniture along such a staircase. To build a spiral staircase with your own hands, you have to deal with complex calculations. This is because the design has a single supporting element. The slightest inaccuracy can cause its destruction. For this reason, the main staircase is more popular, which consists of marches (spans), platforms and steps. Depending on the type of construction, the flight staircase can be straight and turning. 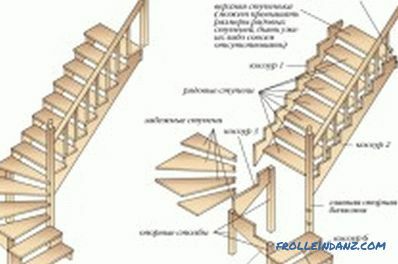 Elements of a wooden staircase. The kosour is a support beam supporting the steps at the bottom of the structure. This element must withstand the maximum load. The bowstring is also the supporting element, which is located at the junction of the ladder to the wall (on one side) and at the device of the span between two walls (on both sides). Due to the fact that the string does not withstand heavy loads, it is practically not used. Installation work is carried out using kosov. Railings are handrails. Their main purpose is the safety of the descent and ascent of a person. Equally important is the decorative function of the railing, which will be able to decorate any staircase. The steps are wooden beams consisting of treads and risers. Stepped on feet tread. The risers are positioned vertically on two adjacent treads. In fact, the riser is a support for the upper tread. Support pillars are used when the construction of a ladder involves the creation of several marches. Immediately before making the ladder, a lot of calculations are made. They can be made both manually and with the help of a special architectural program. Calculation of the size of the stairs. height of the distance from the last step to the ceiling. 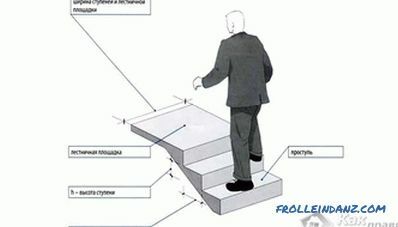 The number of steps is determined by dividing the height of the staircase by the height of the riser (usually the second figure is 16.5-17 cm). Moreover, measurements should be made from the finishing flooring, even if it is not laid. The optimal width of the tread of the ladder should be 30-35 cm. With a too narrow tread it will be difficult to descend from the second floor. If the tread is quite wide, it will lead to a knockdown step. It is most convenient when the width of the march is 0.8-1 m. Full people will quietly walk along such a staircase. And there will be no problems with the movement of furniture and other bulky items. Usually the width of the march is determined based on the width of the tread. 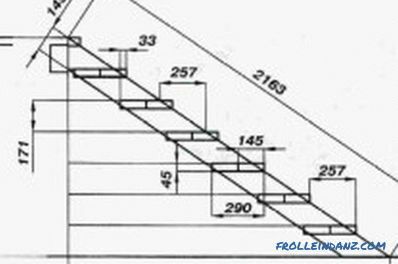 Calculation of the main parameters of the stairs. The length of the stairs is calculated by multiplying the number of steps by the width of the tread. 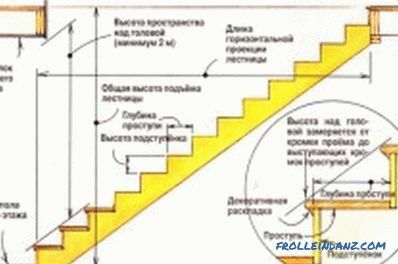 Moreover, the calculation does not take into account the last step, which is actually the basis of the second floor. If the calculated length of the stairs is too large, then you can make not a one-shot, but a two-fly staircase with a turn of 180º. To determine the length of the kosour, the length and height parameters of the ladder are used. The calculation is made according to the Pythagorean theorem: (kosour length) ² = (ladder length) ² + (ladder height) ². To the calculated value should be added 5-10 cm. 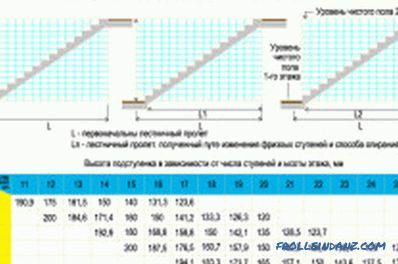 An important indicator in this process, how to make a staircase in a house, is the height of the distance from the last step to the ceiling.In order for each person to ensure a comfortable ascent to the second floor, this figure must be within 1.9-2 m.
Installation of the mid-flight ladder. 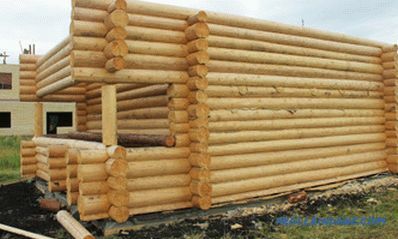 Construction of a wooden structure in a house begins with the installation of kosour. Based on the length of the ladder, trimming is performed. And you need to take into account the thickness of the bottom tread. In kosoure cut openings designed to accommodate the steps. The width of the tread and the height of the riser are marked on the square. Subtracted 2-4 cm and the mark is applied to the inside of the beam. Using an electric jigsaw, saw off an extra part of a bar. The kosour is installed on the place where the staircase will be located. 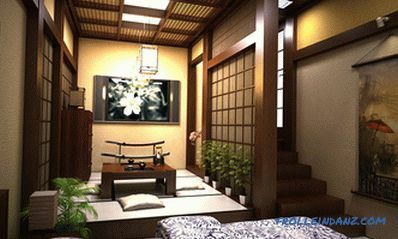 The lower part of the kosour should rest against the flooring, the upper part - into the beam floor of the first floor. Immediately check the correct horizontal location of the filings in which the steps will be mounted. The minimum number of kosurs is two units. But there may be more. It all depends on the size of the load on the stairs. The remaining skewers are cut to the size of the first pattern. The surface of the workpiece is treated with sandpaper. To improve the aesthetic qualities of the outer edge of the kosour is milled. The connection of adjacent kowers is carried out using beams. For this purpose, cuts are made in the lower and upper parts of the kosurs. Beams and anchors are inserted into them, with the help of which the kosoure are fixed. Also kosoura recommended fasten to the walls of the house. 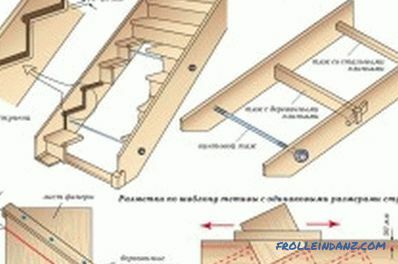 Ways of fastening bowstrings for the stairs. A string is sometimes used. Holes are made in it, in which steps will be located. With the help of anchors the string is fastened to the wall. Be sure to check the correct location of the kosour (on the reverse side) and the string. They must be in a single plane. Otherwise the steps are obtained with a slope. After reliable fixation, the kosour proceed to install steps. First, the installation of risers. According to the workpiece, which has a certain length, sawing occurs boards. The risers are treated with sandpaper and fastened with screws to the front side of the kosour. Subsequently, the screws are puttied or sealed with a decorative coating. After all the risers have been mounted, the treads are secured. From boards it turns out the required number of treads. Their surface is cleaned with sandpaper. Milling protruding outside of the treads. They are stacked on the risers and connected with screws. When using a bowstring, the extreme part of the step is covered with glue and inserted into the groove. Installation work ends with the installation of balusters on the steps, which are fastened with studs. By balusters using screws fastened railings. The final touch is painting the stairs with transparent varnish. It is believed that monolithic structures have increased strength. 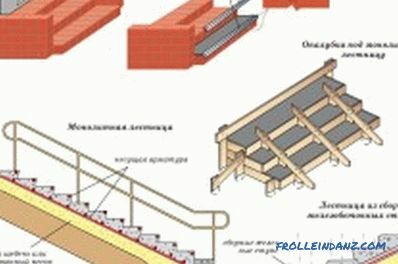 Therefore, now we will talk about how to build such a staircase with your own hands. The best material for its construction is concrete. backfill and concreting of the structure. The construction of the formwork begins with the construction of the foundation. As props used thick timber (10 * 10 cm). First, formwork is created for the landing. In addition to the boards, ruberoid is laid, which protects wooden elements from moisture. The installation scheme of the monolithic staircase. After the formwork has been installed under the mid-flight steps, the structure is reinforced. For these purposes, reinforcement is used, which has a diameter of 12 mm. Horizontal structural elements are attached to the wall. The armature is connected by wire. You should get a cell size of 200 * 150 mm. 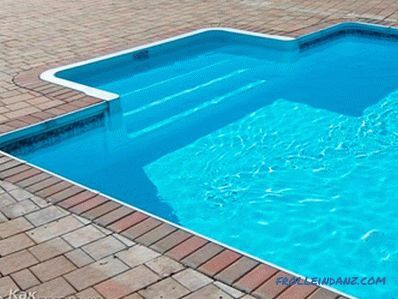 With the help of plywood and metal corners, the formation of steps and formwork is carried out. 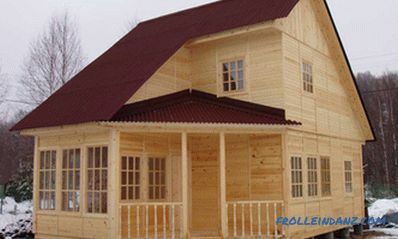 There is a reliable fixation of the entire wooden structure. Special attention is paid to the bottom of the stairs. If the sheets of plywood have small drops, they are aligned with a planer. After the construction of the formwork and the reinforcement, you can proceed directly to such a process as making a ladder out of concrete. 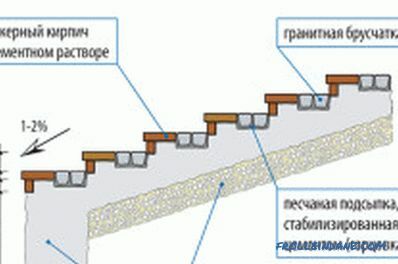 The formwork is filled with expanded clay or coarse sand. The covered surface is leveled, rammed (water can be added) and covered with waterproofing material. Concreting the stairs begins with pouring the mortar into 2-3 lower stages. The stacked solution is pierced with a metal pin. Do not allow air to form in the concrete layer. Otherwise the structure will quickly collapse. A concrete is vibrated using a perforator. After leveling the surface with a trowel, the excess solution is transferred through the formwork to the upper stage. Similar actions (casting, vibrating and leveling) are carried out at the device of the following steps and the landing. Formwork removal occurs in two stages. A week after concreting, the formwork is removed near the steps, which are processed by a grinding machine. After another 1-2 weeks, the remaining formwork is removed. You can proceed to the finishing surface finish.